Where do I even begin when discussing the Philippines? This was probably among the most stressful/travel intensive trips I have ever done. Since distances from one location to another are quite far, it takes a long time to get from point A to point B in the Philippines. On our first day we arrived in Manila, my friend Bonita and I headed to our hostel and we began exploring the city of Manila. 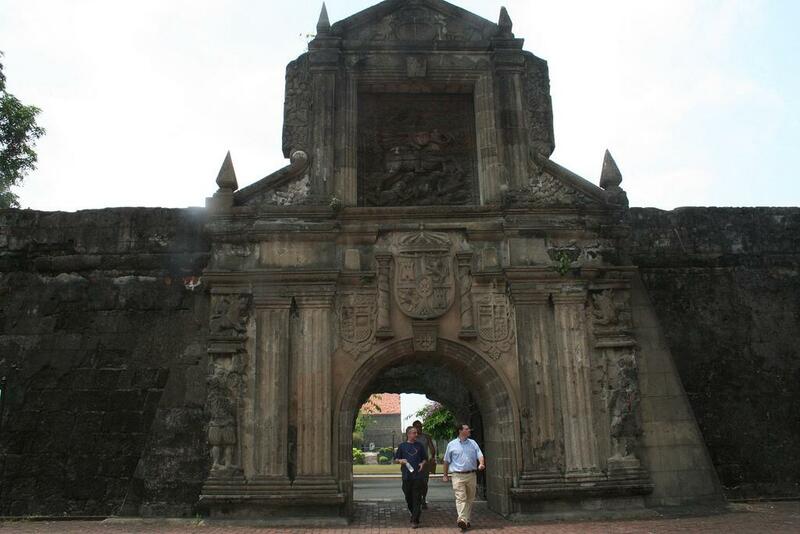 Our first destination was to go see Fort Santiago which is where José Rizal (the Philippines national hero) was imprisoned before his execution in 1896. Most of Fort Santiago was dedicated to Rizal and it appeared like there was almost a shrine of him in every corner. So what makes Rizal so special to the Filipino’s? Well he was among the most prominent advocates for reform in the Philippines during the Spanish colonial era. Rizal wrote numerous books and essays on peaceful institutional reform in the Philippines. After visiting Fort Santiago, we had a little bit of a scary incident while heading over to San Augustin Church but I won’t share that here on the blog (ask me in person and I will tell you the story). Since it was actually a big group of us travelling in the Philippines, my friend and I decided it would be a good idea to go back to our hostel and wait for the rest of our group to arrive from Clarke airport which is approximately 2 hours away from Manila. When the rest of our group arrived we decided to some exploring — local style. We took a jeepney to a local night market in Manila called Divisoria. A jeepney is essentially a jeep that operates like a bus but is much smaller and it feels like a tight, un-air conditioned box. When we arrived in Divisoria, it was a huge market with absolutely no other foreigners. My friends and I were pretty much the only tourists and this was a nice change since we got to experience more local culture. The night market sold a whole bunch of random and useless things so I didn’t end up buying much but the best thing about the night market was the mangoes! Since mangoes are my favourite fruit, it was like heaven to be surrounded by cheap, fresh mangoes everywhere! The next day we took another flight to Puerto Princesa which is the capital of the province of Palawan which is suppose to be cleanest city in the Philippines (and trust me, it was a nice change from Manila since Manila was one of the dirtiest cities I have ever been to). Puerto Princesa was a cute little town with little to no tourists. The city is covered in beaches and wildlife and the most famous attraction: The Underground River. Unfortunately due to time constraints we didn’t have a chance to visit the Underground River but instead we went to Honda Bay (which is island hopping) and we went to a secluded beach where it was just me and my 4 friends on the island. It was pretty cool to have a beach all to yourself for a couple of hours. It was here at this beach that I saw some of the biggest and loudest waves I have ever seen in my life! Although the waves were really far from us, you could hear them and see them very clearly! We ended our one night in Puerto Princesa by having an amazing dinner at the famous sea food restaurant in town: Ka Lui! The food was fresh and all different types of seafood. The meal started with appetizer of clam soup then we moved onto seaweed salad, had amazing fish (twice!) and ended the meal with a fruit salad served in coconut. This was probably one of the best meals I have ate on my travels…or in my life…lol.